This is one of three panel from a casket (known as the Werden Casket) probably made about 800 in the Lower Rhine area, possibly Werden. The date and origin of these plaquettes have been the subject of considerable scholarly debate, with the majority of authorities devided between an Early Christian and Caorlingan origin. 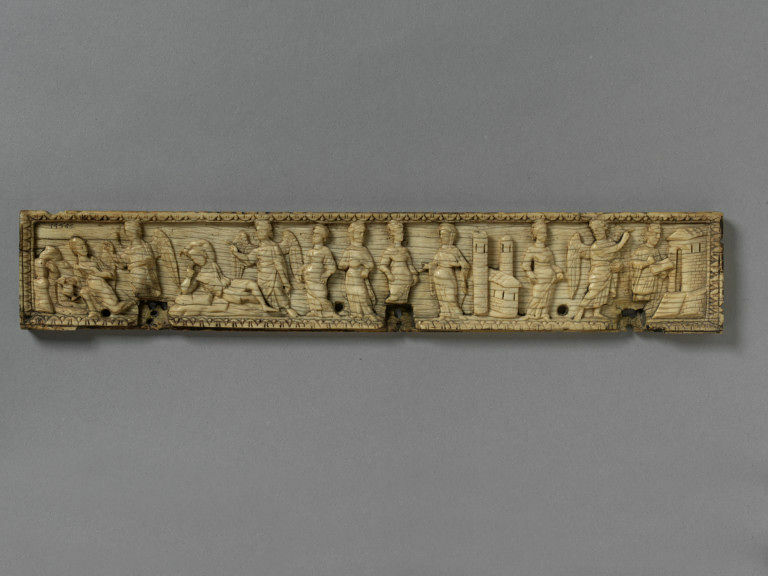 This and the two other ivory panels from the Abbey of Werden in the V&A collection depict a mixture of scenes from Biblical and Apocryphal stories. They have been linked stylistically to a book-cover in the treasury of Milan Cathedral and other surviving panels and pyxides. The scenes of the Annunciation, the Magi seeing the Star, the Nativity and the Adoration of the Magi closely resemble the Milan book covers. Other panels which are thought to belong to the same group can be found in the Berlin, Toulouse and Nevers museums and also possibly a panel in the British Museum representing Christ disputing with the Doctors. Three pyxides, one still at Werden, one in the museum at Rouen and the third in Florence have also been identified as belonging to the same group. One of three panels from an ivory casket (known as the Werden Casket), carved ivory with a narrow border of leaf ornament and on the top side is a running band of egg-and-dart decoration. The scenes depicted from left to right are as follows: Annunciation at the Spring, St Joseph's dream with the Virgin standing by, The Visitation (the Virgin accompanied by a maid) before the city of Judah, represented as a church with two round towers, and the Entry of the Virgin into the Temple to drink the Bitter Water. Formerly in the Abbey of Werden, Westphalia, Germany. Purchased by the museum in 1866 from John Webb, £84. The Annunciation at the Spring : The Anunciation to Mary is related in the Gospel according to Luke i 26-38. This version of events makes no mention of a spring or well, but states the angel "came in unto her" suggesting that the Anunciation took place indoors. The scene depicted on the present relief is apocryphal, based on a the writings of Pseudo-Matthew or the Protevangelium of James. In which the angel met Mary and greeted her at a well or fountain, and when she fled from him in fear, he followed her into the house and continued his message there. St. Gabriel’s Church of the Annunciation in Nazareth is built above a spring held to be the source of a well where Mary drew water each day. This is the site where the Greek Orthodox tradition maintains that the Angel Gabriel revealed to Mary knowledge of the impending birth of Jesus. The figure of the Virgin in this Annunciation closely resembles the St Paul on one of the British Museum panels. St Joseph's Dream : Joseph's suspicions, aroused by Mary's immaculate conception, are allayed by the archangel Gabriel who appears to him in a dream. This story also has its origins in apocrypha. It can be found in the Protoevangelium Jacobi purportedly written by "James the brother of the Lord", i.e. the Apostle James the Less. It is based on the canonical Gospels which it expands with legendary and imaginative elements, which are sometimes puerile or fantastic and was a key source for extra detail of the life of the Virgin. The presence of the Virgin beside the angel in St Joseph's Dream is not apparently found elsewhere on Early Christian ivories. The Visitation : Mary went to visit her cousin Elizabeth, who was three months pregnant with John the Baptist. When she entered Elizabeth's house, the baby John leapt in the womb and Elizabeth greeted her as "the mother of my Lord." The event is related in Luke 1:39-57. In this biblical version there is no mention of the maid who appears to accompany Mary on the present relief. Essentially the same story is told in the Protevangelium Jacobi, which places the recognition events at the doorway of Elizabeth's house. Most images follow the Protevangelium in putting the figures at or near the doorway of a house, or by a collection of buildings intended to represent the "city of Judah" where Luke says Elizabeth lived. A mosaic ca. 540 in the Basilica Eufrasiana, Porec, Croatia shows the visitation taking place at the thresh-hold of a house. The Virgin entering the Temple: Various interpretations of this last scene on the relief have been discussed by Professor Baldwin-Smith, who believes that it is the Virgin entering the Temple during her childhood; but an event subsequent to the Annunciation is presumably intended and it seems probable that the subject, taken from the Protevangelium Jacobi, is the Virgin led to the Temple for the Test by the Water of the Ordeal. Joseph and Mary are brought to tribunal to face a test of Mary's virginity. Chapter 16 of the Protevangelum records the event as follows : "the priest said: I will give you to drink of the water of the ordeal of the Lord, and He shall make manifest your sins in your eyes. And the priest took the water, and gave Joseph to drink and sent him away to the hill-country; and he returned unhurt. And he gave to Mary also to drink, and sent her away to the hill-country; and she returned unhurt. And all the people wondered that sin did not appear in them. And the priest said: If the Lord God has not made manifest your sins, neither do I judge you. And he sent them away." On other ivories of the period, the subsequent scene, the actual drinking, is also usually represented (for example on the ivory throne at Ravenna, on book-covers at Etschmiadzin in Armenia and in the Bibliotetheque Nationale at Paris and on a relief lately in the Stroganoff Collection in Rome); in some instances (such as the present example) the Virgin is accompanied by an angel. 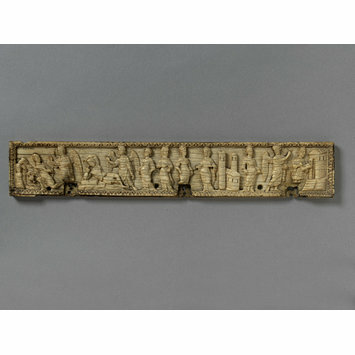 The eastern or western origin of this panel has been much debated. The architecture depicted on the present relief may be an indication of oriental origin. The facade flanked by two towers is a style of architecture associated with the Christian East, however the shed-like roof over the nativity scene on panel 149A-166 is a more western feature. Dalton concludes that the precise localisation of the ivories can only be conjectural. It is obvious that the panels formed part of a flat, shallow casket with a sliding lid. A second short panel - now missing - would probably have shown the Journey to Bethlehem, and the lid was perhaps carved with a Christ in Majesty.